Star Trek Reviewed: (237) Recent Upgrades for Star Trek Reviewed. (237) Recent Upgrades for Star Trek Reviewed. For the time being, I am using this page as a place to list films added since August 2011, but not given headlines. Some will never get headlines. For others, this will be a holding area for headlines. This will include a list of films added which would not get headlines individually, but which collectively change a webpage enough to warrant one. Make a headline as soon as possible. In ready-to-list Headline format. Good enough for a headline. In ready-to-list Headline format. Don't give a headline unless there is nothing else. In ready-to-list Headline format. Waiting grading. In ready-to-list Headline format. Hi, <Say something about the production, get it from the headline post?> I'm one of the editors at Star Trek Reviewed and we've headlined your production, http://startrekreviewed.blogspot.com and https://www.facebook.com/startrekreviewed. Could we have permission to include some of your graphics? April 19, 2019, Find, TITLE from PRODUCER. Promotional blurb. LINK (mm:ss). For more STR BLOG TITLE see LINK. April 19, 2019, New Release , TITLE from PRODUCER. Promotional blurb. LINK (mm:ss). For more STR BLOG TITLE see LINK. Find, from 6Arrows, Treknologic - Minecraft Machinima Parody of the Adventures of the USS Relativity. Find, Star Wars v. Star Trek: A narration with stills illustrating the story. Find, Today Is A Good Day To Die, Klingon recites a poem, http://www.youtube.com/watch?v=ZNpRiwpQ6jE&feature=related (4:18). For more assorted short films, see http://startrekreviewed.blogspot.com/2009/06/207.html. Picked as a Quick Pick Treasure, http://startrekreviewed.blogspot.com/2009/06/1.html, a film set aboard the Starship Tristen, "Sepulchre," https://www.youtube.com/watch?v=s06KKk9Y6ek(10:30). Starship Tristin is the setting for one of many series of films from Potemkin Pictures. For all of Potemkin Pictures releases, including all those set aboard the Starship Tristen, see http://startrekreviewed.com/studio.php?id=5. Find from Professional Filmmaker Sculptdouble, (Claymation, Silver Age) I Am Beautiful by Joshua and Nathan Flynn, https://www.youtube.com/watch?v=gw2vSyKYe0Q (0:48) or https://www.facebook.com/sculptdouble/videos/1497940073666453/ (0:40). For more professional comedy, parody, commercials, tributes, and foreign imitators, see http://startrekreviewed.blogspot.com/2009/06/218.html. Find, From MarvelousTV World of Heroes, https://www.youtube.com/user/worldofheroes/featured?disable_polymer=1, Bad Days Season 2 Episode 4, https://www.youtube.com/watch?v=H8s9aXRL95E&t=1s (3:10) or https://www.facebook.com/solongonewsmn7/videos/1438380936237452/. For more Professional Star Trek Parodies, Tributes, Commercials, Foreign Imitators, and Educational Videos, see http://startrekreviewed.blogspot.com/2009/06/218.html. Find, from Anytime Fitness, an international franchise of 24-hour-a-day gyms, Star Trek Into Fitness, a corporate parody video, https://vimeo.com/103202366 (7:08). For more Professional Star Trek Parodies, Commercials, Foreign Imitators, and Educational Videos see http://startrekreviewed.blogspot.com/2009/06/218.html. Find, from Plotagon, an animation suite, - Star Trek Romance https://www.youtube.com/watch?v=pzBoLZPeSwc (0:50). For more Star Trek Parody and Comedy see http://startrekreviewed.blogspot.com/2009/06/208.html. Find, Star Trek Parody from The Tonight Show with Jay Leno: https://www.dailymotion.com/video/x3s38q9 (2:15). For more Professional Star Trek Parodies, Tributes, Commercials, Foreign Imitators, and Educational Videos, see http://startrekreviewed.blogspot.com/2009/06/218.html. 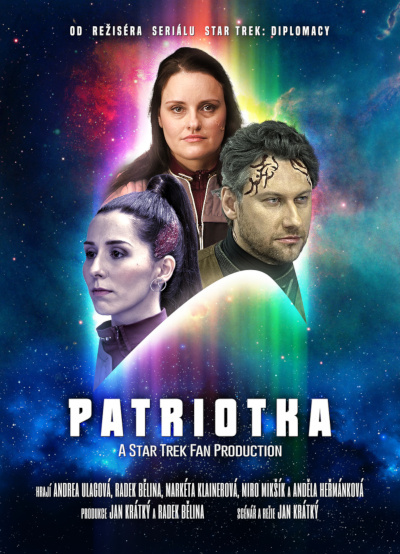 Picked as a Quick Pick Treasure from Star Trek Diplomacy (A Silver Age Czech Langauge Star Trek Fan Film Series) "Patriotka," https://www.youtube.com/watch?v=wC_D939D7YY (13:56). Also with English subtitles, original posting. 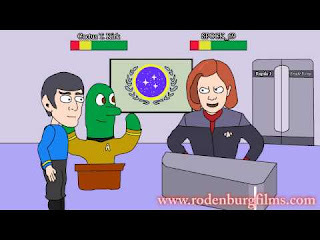 (Also with Portuguese subtitles, here: https://www.youtube.com/watch?v=Qe8Xfl3_jKg (13:56)) For earlier episodes of Star Trek Diplomacy, see https://startrekreviewed.blogspot.com/2009/06/141.html. For a collection of Czech Language, Star Trek Fan Films see http://startrekreviewed.blogspot.com/2009/06/227-czech-language-star-trek-fan-films.html. 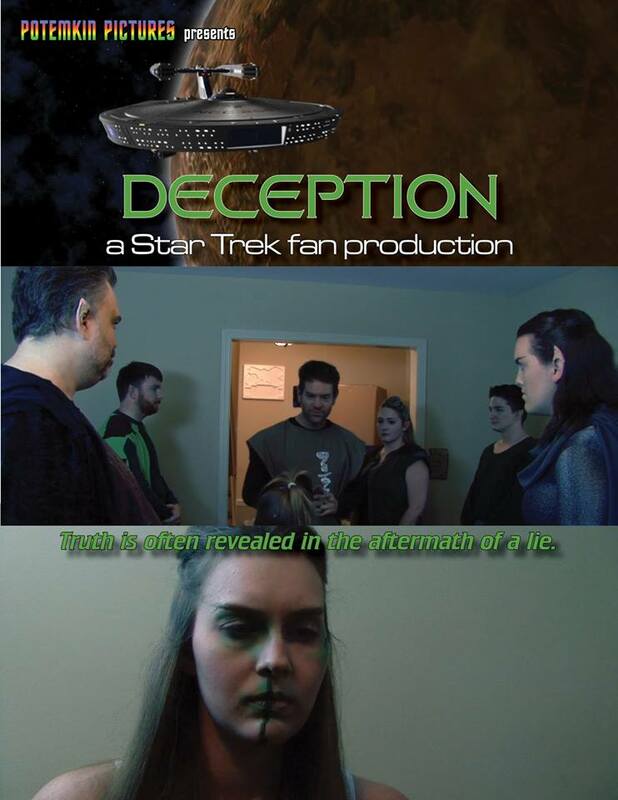 For more Plotagon Star Trek Fan Films, see http://startrekreviewed.blogspot.com/2009/06/215.html. More finds at the bottom, not indexed and otherwise complete, though. Find, from Flamingo Film Festival, Klingon Sound of Music, https://vimeo.com/42036095 (5:56). For more Comedy and Parody Star Trek Fan Films, see http://startrekreviewed.blogspot.com/2009/06/208.html. Find, from SCTV, A Canadian TV show, A Star Trek skit, "Check Please,"
Find, from Saturday Night Live, Star Trek V: The Restaurant https://www.nbc.com/saturday-night-live/video/star-trek-v-the-restaurant-enterprise/n9513?fbclid=IwAR19zYiMZYWfn8rOPkp0Tu3m8qHW29k4wxhSNMPDZMWq29AURBYp-w2TdD0 (7:37) For more Professional Star Trek Comedies, Tributes, Commercials Foreign Imitators, and Instructional Videos, See http://startrekreviewed.blogspot.com/2009/06/218.html. Find, Star Trek (produced 1976, posted 2017), from bruchorama, https://www.youtube.com/watch?v=_t01n4_j9tE (6:53). For more historic Star Trek Fan Films from the 1960s and 1970s, see http://startrekreviewed.blogspot.com/2009/06/204.html. I. Star Trek Cartoon Parody http://www.youtube.com/watch?v=Lr0eTZKL8Aw&feature=related (1:05) (pictures Janeway)* Move to Star Trek Restricted. (B) Raumschiff Highlander http://www.raumschiffhighlander.de/ . I am taking the word of a German Trek Fan that this is a German language Star Trek Fan Film. (I was once told Raumschiff was a French film... but it didn't sound like French to me). He says that it was an entire series, only a small part of which is still on the web. http://www.youtube.com/watch?v=eh4v98Ez-b8&feature=related (33:01) For more information, see: http://startrekreviewed.blogspot.com/2009/06/43.html. This is Part III of III, and when Parts I and II are up, with English subtitles, it will get a headline. (G) This fellow: http://www.youtube.com/user/ThomasF1976 seems to be building Star Trek animation modules. I'm not clear where he's going with it, but it's the U.S.S. Elohim. Elohim is not German, it's Hebrew for one of the names used in the Bible for God. N. Voyager: The Motion Picture. A fan imagines the Voyager motion picture he wishes had been made. http://www.youtube.com/watch?v=VjbIUHBz1LY (2:58). Also, many Voyager recuts. 11. Two films have been added to "Really, Really Bad Stuff." 12. Filmed or Videotaped Star Trek for Live Stage Performance. This is a commercial for a Star Trek concert: https://www.youtube.com/watch?v=SmvR1oNnUQk (2:09). I don't think I've introduced the section at all. 14. Star Trek: Flight of the Condor. This Silver Age series has three short Mechinima episodes. There are no voices, the dialogue is told with captions. This is a separate, earlier TOS-era short which is also Mechinima with captions, not voices. (2) Hello Geekette S1 E11 Le fan film 2/3 : Silence on tourne ! Channel: http://www.youtube.com/user/Grasser6 is from the Czech Republic. This is a movie that is begining of a story, for next sequels and and promotion of Star Trek and STO. I am from Macedonia, Skopje. The movie was made from all the fleet members who are mainly from Macedonia, Serbia, Croatia and Bosnia. it was fleet effort to film it and produce it. Star Trek Galaxies. English language animated Star Trek Fan Film with German subtitles. Alternative Universe. 2. "Escape of Khan" - Launch of the Botany Bay. The creator also has a lot of other CGI-only videos. http://www.youtube.com/watch?v=sKtieXEBLcE&feature=youtu.be (6:45) Story is told with captions and CGI. In effect, I'm working to make Spanish subtitles for "Starship Exeter". I didn't know that project until one month ago. I was translating an interview of a member of "Star Trek: Phase II" when this person speaks about a project titled... "Exeter". Then I searched in Internet and... what a surprise! It's an excellent job! And I found that it doesn't exist Spanish subtitles, so I started to make them. I know your website "Star Trek Reviewed"... Of course! (y) It's one of the best data bases about fanfilms in Internet. I often visit it. Even there is a commentary of mine signed as "STPhase2Ilustrada". If you want you can included Spanish language in all reviews of new "Phase II" movies (episodes, vignettes, trailers, teasers...) from the Episode 7: "The Child". Also, I know: http://sites.google.com/site/startreklatino/ It's a great job. =D I have got versions of some subtitles which are included in that website, but in Spanish of Spain. (It happens that Spanish in Spain is different of Spanish in other countries, although almost equal. In the same way English of Britain is different of English in USA.) However, I haven't still published any of them because I'm not sure what is the best way to do it. Of course, when my subtitles are released I'll report you. Thank you very much for your great job in your web. 31. eMBee has provided me with the following information, which is the timed output of many Star Trek Fan Films as of Oct. 10, 2013.
the meantime i added those up too. updated for style so it will look better when you copy it. Update: added to the list are Star Trek Beyond, The Time Warp Trilogy and Star Trek: Eagle, also, Phase II missed counting a few shorts. I also changed my counting method. Previously i used a toolto extract the length of each file which returned values in millisecond acuracy, and now i am just adding the minutes and seconds as shown by the video player. This caused some rounding differences. Sorted by time, this list includes all series with more than one episode which i have seen. (I have not yet seen all of Unity or Reliant, but i have the files so i added them in) Highlander is sorted before Encarta because i am missing episode 3 which is not published yet and i am sure it is longer than the 15 minutes difference. I also included Frontier Guard, but you can skip them if you like. Bloopers and commentary videos are not counted unless they are part of episode video itself, which is the case for a few Beyond episodes for example. "Star Trek The Witch," Part 1: https://youtu.be/IM4MqtBRpTg (7:14). For other Plotagon animations, see https://startrekreviewed.blogspot.com/2009/06/215.html. Awaiting comment: Planetfall "Amok Beer." https://youtu.be/ET0Oe-D1QhI (10:20) I am a bit unsure what to do with the offensive and poorly produced, "Planetfall and Star Trip" in which the character's primary thing is to force either other under threat of being shot to drink beer. The title in the film is "Amok Beer." I'm not at all sure these folks are teens rather than young 20s, and I'm leaning toward Star Trek Restricted. This is pretty good adhoc comedy, in character, with a large body of work - 27 releases. It's like a an audio drama improv theatre. I haven't had a chance to have a listen to much of it, but it could be risque. Mash-up or recut - List it under recuts without a headline? https://youtu.be/ImB8nwZUgrQ mostly a recut with some inserted animation. I'm inclined to put it under recuts, but I'm open to other opinions. https://youtu.be/49krWtP0oBc I agree with the poster that this is not a parody of any specific space opera. I don't think it is a Star Trek Fan Film. As usual, I am open to discussion on it, though. The fourth one is a professional skit which we did not previously have, but the channel has many pro skits. It will take me a bit of time to go through the whole channel and see which ones are new and which are repeats of what we already have. Other than that, I have added 3 previously unknown Pro Star Trek skits to Blog 218, and have created a Headline for these 3 (4, if you think the Sugar Puffs commercial should be included) postings, all based on Sven's 4th discovery. Are we recording Fan Edits? Films made up of clips re-edited to change the storyline? I would say no because it's basically the same editing as a music video. This is meant to be a parody, comedy but I thought it was just weird! The channel has more of them! What's our position on works adapted from the professional audio dramas published by Peter Pan & Power Records?